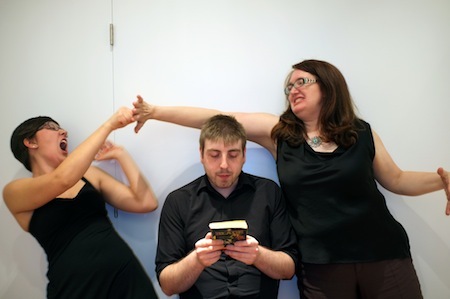 Secretly Illiterate Theatre is bringing its unscripted fantasy epic Tomes to the 2013 Toronto Fringe Festival. Every night, seven energetic improvisers will perform a live stage adaptation of a paperback fantasy novel… without ever reading it. Tomes runs from July 5 to 14 at St. Vladimir’s Theatre. This smart and nerdy show is based on the colourful (yet sometimes baffling) covers of fantasy and science-fiction paperbacks. Each show begins with an audience member choosing from a selection of books never read by any of the performers; then, based solely on the cover art and promotional copy, the cast performs the book beginning to end. The result is a hilarious, genre-savvy, and occasionally even accidentally accurate stage adaptation. And the audience member gets to keep the book! ● The young peasant isn’t a master swordsman. He’s more of a dance prodigy. ● A beautiful princess abandons her kingdom to search for friendship bracelets. ● An evil wizard thinks conquering the world will finally impress a blind date. ● A ronin warrior learns to teleport using the “basement of the universe”. Secretly Illiterate Theatre was founded in 2012 to produce improvised longform narratives. The company’s members have performed at improv festivals in Toronto, New York, Chicago, North Carolina and Virginia, and in The Second City’s conservatory program. Several teach and coach improv regularly in Toronto and elsewhere. If you think a trip to a used bookstore can too be a perfectly fine date, have ever treated yourself to an entire season of Game of Thrones in one sitting, have looked up from TV Tropes to find that it’s mysteriously turned from day to night outside, or even just cried when someone died in a Dragonlance novel, Tomes is the show for you! Tickets are available for advance purchase at the Toronto Fringe box office up to three hours before curtain (service charge applies), or may be bought at the venue starting one hour before curtain. Multi-show passes are available at the Fringe box office.